“Medicine Master Vaidurya Light Tathagata” is also known in short as “Medicine Buddha”. To each side of Medicine Buddha stand the two principal Bodhisattva attendants, Sutyaprabha and Candraprabha, who are also Bodhisattvas representing moonlight and sunlight, respectively. By merely chanting the mantra of the Medicine Buddha one can prevent disasters and natural calamities, and can also increases one’s lifespan. According to the “Sutra of the Merit and Virtue of the Past Vows of Medicine Master Vaidurya Light Tathagata” , sentient beings who hear the name of the World Honoured One, “Medicine Master Vaidurya Light Tathagata”, and sincerely accept and uphold it without any doubts, will enjoy a healthy and prosperous life. 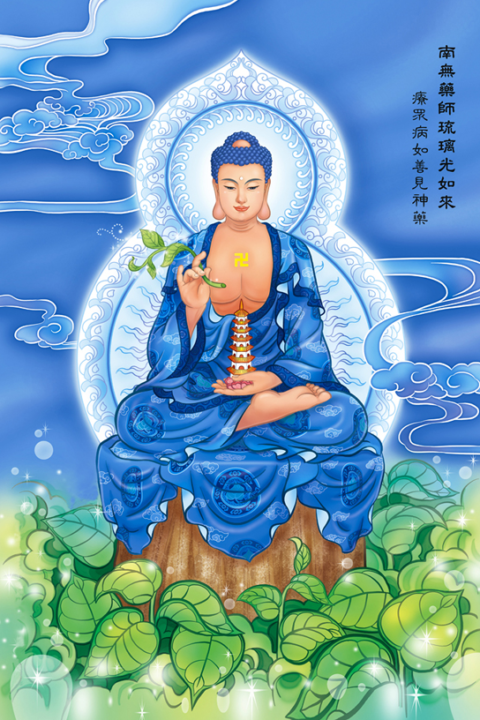 Medicine Buddha is the great Healing Master, who made the following twelve great vows to clear the cause of disease and illness, and to eliminate all disasters. The twelve great vows of Medicine Buddha (Extracted from The Sutra of the Master of Healing). 11. I vow to save those who suffer from starvation and those who committed crime to obtain food. If they hear my name and faithfully cherish it, I shall lead them to the advantages of Dharma and favour them with food and eventually lead a tranquil and happy life.